I’ll Just Have The Pork, Please. I’m Sorry, A 10% Whatnow? Hot Whatnow? Extra Gluttens For Me Please The Duck? 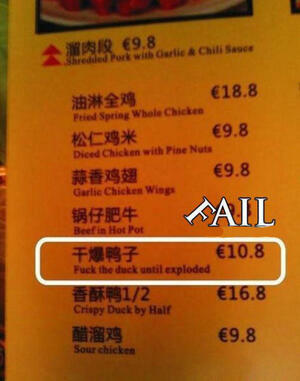 Posted in Misc and tagged duck, exploded, menu at 3:15 pm on September 8, 2010 by Niall Murphy.